Fig. 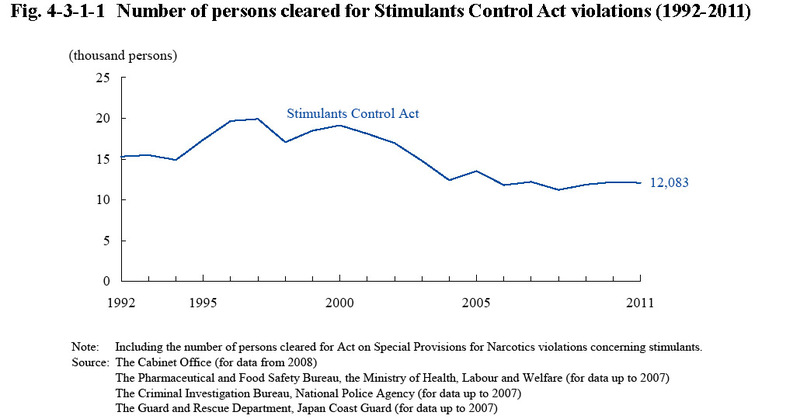 4-3-1-1 shows the number of persons cleared for Stimulants Control Act (Act No. 252 of 1951) violations (including Act on Special Provisions for Narcotics violations concerning stimulants; hereinafter the same in this section) over the last 20 years. The number of persons cleared started increasing from 1995 and reached nearly 20,000 in 1997, but was generally on a decreasing trend from 2001. It was on a slightly increasing trend from 2009 but decreased by 1.0% from the previous year in 2011. Fig. 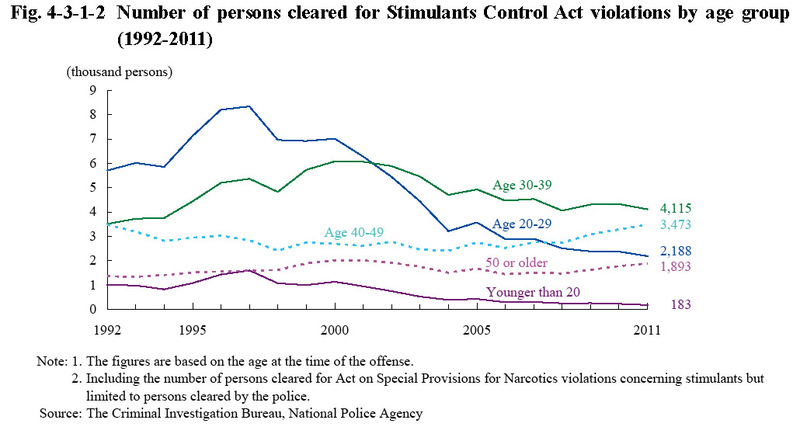 4-3-1-2 shows the number of persons cleared (limited to those cleared by the police) for Stimulants Control Act violations by age group over the last 20 years. The number of cleared persons aged 20-29 was the largest of all age groups until 2001, but was on a significantly decreasing trend since then. From 2002 the number of those aged 30-39 was the largest. In addition, the number of cleared persons younger than 20 was generally on a decreasing trend from 1998, and decreased by 19.7% from the previous year in 2011. Table 4-3-1-3 shows the number of persons cleared for Stimulants Control Act violations (limited to those cleared by the police) in 2011, and the number of them cleared for offenses with the purpose of profiting from them (for-profit offenders) and organized crime group members, etc. by type of violation. In 2011 the percentage of those cleared for Stimulants Control Act violations with the purpose of profiting from them was 5.6% and the percentage of organized crime group members, etc. 55.3%. The percentage of foreign national offenders was 6.0% in 2011. By nationality, etc., the largest number came from South/North Korea (241 or 33.9%), followed by the Philippines (86 or 12.1%), Brazil (73 or 10.3%), Iran (47 or 6.6%), and China (including Hong Kong and Macao but excluding Taiwan; 44 or 6.2%) (Source: The Criminal Investigation Bureau, National Police Agency). The countries or places from where the stimulants of 185 cases cleared by the police in 2011 were illegally imported included Mexico accounting for the largest number at 25 cases, followed by Hong Kong at 13, France at 13, the U.K. at 11, China (excluding Taiwan, Hong Kong, and Macao) at 11, and Taiwan at 10 (Source: The Criminal Investigation Bureau, National Police Agency).